This is the second half of my Jamestown Air Spectacular photo set. I’ve broken the set into two posts to keep page load speeds reasonable for viewers with slower Internet connections. If you’ve just arrived here, maybe go back to Part 1 first by clicking on this link. I’ll resume with another aerobatic aircraft. This time, the Pitts Special ‘Super Stinker’ of Chris Sperou. 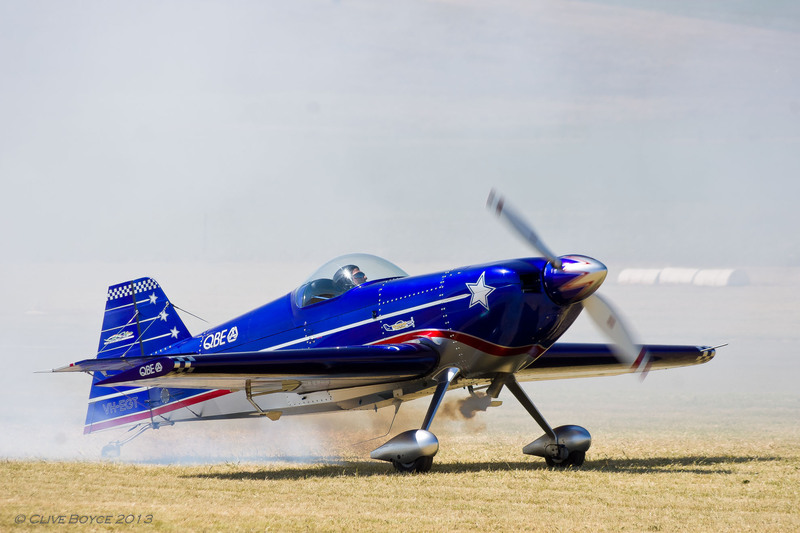 Chris is a South Aussie local and an aerobatics legend in Australia. I have seen him a number of times over the years, and I thought the display he put on at Jamestown was as good, if not better, than any I have seen. Accelerating down the runway, about to get airborne. For Chris, that means going near vertical within moments of the wheels clearing the tarmac. What I hadn’t previously noticed until posting this photo was the amount of bracing used on the tail-fin and horizontal stabilisers. 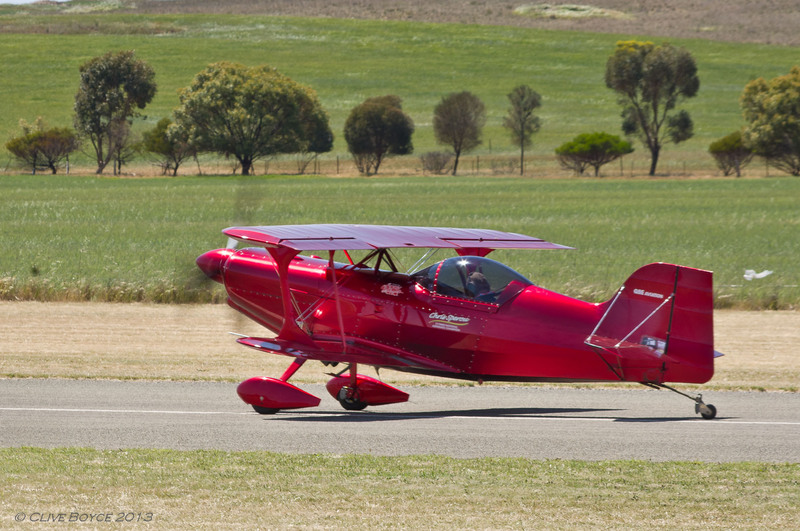 This entry was posted in Aviation, Places to Visit, Regional South Australia and tagged Air Show, Aviation Photos, Classic Aircraft, Historic Aircraft, Jamestown, Jamestown Air Spectacular, Plane Photos on May 7, 2013 by aussiesouthlander. Last spring, a classic aircraft airshow, the Jamestown Air Spectacular, was held in South Australia’s mid north. Jamestown is a modest sized rural town approximately a three hour 200km drive north of Adelaide, and located in prime cropping country. I day-tripped up from Adelaide, making a long but enjoyable day. Jamestown airport has a single 1350 metre runway which was sealed in 2009 as the result of a lot of fundraising by the local aviation club and with support from the local council and businesses. The airshow is held once every three years. For an event held far from a capital city, it received wonderful spectator support and showed off a good blend of enthusiast aircraft types. All the photos in this post were taken with my Pentax K-x dSLR using a Pentax DA 55-300 zoom lens. While there were a few photo opportunities that would have benefited from a shorter focal length lens, there was a reasonable amount of dust in the air which I did not want entering the camera body while changing lenses. My sensor already had a few blotches of gunk on it and I had no desire to add more! So, I just stuck with the 55-300. I used a monopod extensively to reduce camera shake. A welcome side benefit was relieving me of the need to hold the camera and lens up for the many hours of photo opportunities that the Spectacular provided. I really recommend a monopod when using longer focal length lenses – much more portable and convenient that a tripod while still offering a considerable camera steadying benefits. I own a Manfrotto 776YB aluminium monopod fitted with a 234RC tilt head. The 234RC is fitted with a convenient quick release plate. The same quick release plate is used on my tripod, keeping life pretty simple. Throughout the day I roamed the general admission area, but for keen attendees, there was also a premium viewing option which was situated by the aircraft hard standing area. Some accredited photographers were out on the airfield itself, enjoying close up, obstruction free viewing. Lucky devils. It was a great day both for flying and photography – a light northerly breeze running straight down the runway and a clear cloudless sky. As we were walking into the spectator area, this little number was just finishing its routine and in my first photo of the day was photographed returning to its parking area. DR107 aerobatic special. Built by the owner from 50 blueprint plans. Capable of eye-popping +10 to -10G turns, and a complete 360 degree roll in under one second. Finished in stunning metallic blue paint.